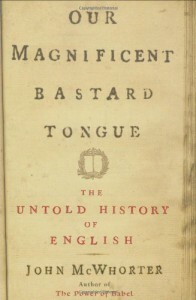 This is an extraordinarily delightful little book that highlights some of English's lesser known idiosyncrasies because, as the author notes, English is not just a collection of words, nor is its genius an markedly unusual openness to new vocabulary. I first encountered John McWhorter with his book The Power of Babel: A Natural History of Language Paperback, which traced the evolution of languages from a "first language" and which is also highly recommended. (Actually, having read [b:The Singing Neanderthals: The Origins of Music Language Mind and Body Paperback|474435|The Singing Neanderthals The Origins of Music, Language, Mind, and Body|Steven Mithen|http://ecx.images-amazon.com/images/I/51fwF4TYjZL._SL75_.jpg|365445], one could argue that there never was a "first language" since it's entirely possible that the first homo sapiens with the language instinct were talking to themselves before they ever began communicating with each other.) This book continues in Babel's vein, focusing on English. The first chapter discusses two characteristics of English not found in any of its Germanic cousins but that is found in Celtic languages. Namely, the meaningless "do" and using the present participle (-ing) to express the present tense. For example, in the sentence "Did she go to the store?," "do" isn't really necessary - "She went to the store?" could (and does in other tongues) work just as well but English doesn't like to say it that way. And while it's fallen out of use in modern English, Shakespeare used it in positive statements all the time - "She did go to the store, Yorick!" And in all other Germanic languages (and, again, in nearly every other extant ones), to say you are doing something in the present tense, you say (for example) "Er schreibt" - "he writes." English, however, likes to say "He is writing," reserved "he writes" for something like "He writes for a newspaper" or "He writes every morning from 9 to 10." In Chapter 2, McWhorter focuses on the somewhat arbitrary nature of grammar. While he supports the idea that a language needs a standard grammar and that it should be taught, as a linguist McWhorter wants to point out that language and grammar are constantly evolving and that nonstandard grammar is only "wrong" depending on context. Arguing before the Supreme Court, one probably wants to avoid ebonics or Jamaican patois but within the appropriate milieux, those two variants make perfect sense (and are no less expressive and complex than standard English, no matter the detractors). In Chapter 4, McWhorter sets out to demolish the popularly conceived idea that grammar shapes thought. First posited in any serious manner by Benjamin Whorf, the idea is that a language's grammar shapes how its speakers view the world. Thus, the Kawesqar of Chile have no concept of the future because they have no future tense marking. Of course, neither does Japanese, yet it is perfectly capable of letting its speakers express themselves regarding future events. And then there's Whorf's prime example - the Hopi language, which he claimed had no tense marking at all. This turns out to be nonsense - the Hopi are capable of understanding tense and their language can and does make temporal distinctions. They just don't do it as English speakers do. McWhorter does allow that the neo-Whorfian reformulation of Whorf's original thesis may hold some validity but not much explanatory power. It may highlight an interesting quirk in a language, but little else. As McWhorter writes: "The idea that the world's six thousand languages condition six thousand different pairs of cultural glasses simply does not hold water. The truly enlightened position is that, by and large, all humans...experience life via the mental equipment shared by all members of our species. No one is `primitive,' but just as important, no one is privileged over others with a primal connection to The Real" (p. 169). The final chapter is the most exciting for me because McWhorter discusses a hypothesis for why proto-Germanic (English's "grandfather") developed an interesting characteristic - a sound shift from "p," "t" and "k" to "f," "th" and "h," respectively. The sound morphing is unusual in that the former sounds are stops, the latter fricatives ("hissy" sounds in McWhorter's words). It's hard to see why, in isolation, a "p" would become an "f." However, if proto-German had been in contact with a language rich in fricatives, it's more than possible. Recent archaeological evidence and linguistic reconstructions are suggesting that a Semitic influence is responsible, most likely Phoenician or Punic (Carthage), Phoenician's "daughter." Both civilizations had documented contact with Northern Europe around the right time (last half of the 1st millennium BC). The evidence is circumstantial, probably forever so, but strongly suggestive. Phoenicia had trading stations on the Atlantic side of Gibraltar (the Tarshish of Biblical fame) and Britain had long been a source of tin so it's not impossible to imagine a relatively large Semitic presence in proto-Germanic's bailiwick whose only evidence remains in the oddities of Germanic sound change. I strongly recommend this general work, even if you're not particularly interested in languages. It's short and written entirely for a nonspecialist audience but appeals to language fans as well. I'll also take this opportunity to recommend McWhorter's other work.